Grippy Mats meet NFSI standards. Available in 50 ft or 100 ft size, Grippy Mats feature middle liquidproof barrier layer to keep liquids from passing through on to floor. Designed with repositionable adhesive bottom layer, units can be used in wet, slippery or fall-prone areas. Eliminating trip, slip and fall accidents, product keeps floors dry and safe and can stay down for up to 12 weeks before changeout. Minimizing tracking, Mat won’t bunch up, flip over or shift around. New Pig Corporation, the leading brand that helps workplaces manage leaks, drips and spills to create safer, cleaner and more productive environments, now offers a line of PIG® Grippy® Floor Mats to help facilities improve floor safety and maintenance and cut potential liability claims and costs dramatically. Grippy Floor Mat is the world’s first adhesive-backed absorbent mat. Unlike standard carpeted or rubber-backed floor mats that become trip hazards, Grippy Mat won’t bunch up, flip over or shift around. NFSI Certified as a high-traction surface, it helps reduce slip-and-fall claims by as much as 90% when used as part of a floor safety program. "Placing this mat in wet, slippery or fall-prone areas helps eliminate trip, slip and fall accidents," said Tim McMillen, New Pig Product Manager. "It's not going to budge and it's easy to clean, too. Sweep, vacuum or scrub it stays in place during routine floor scrubbing or buffing." Constructed with a durable absorbent top layer, a middle liquidproof barrier layer to keep liquids from passing through to the floor, and a repositionable adhesive bottom layer, Grippy Mat keeps floors dry and safe and can stay down for up to 12 weeks before changeout. Engineered fibers absorb and evenly distribute moisture throughout the mat to prevent surface puddles and minimize tracking. The ultra-thin material can be custom cut to any length or shape desired, which creates a neater, more attractive facility environment. And, rental mat users can save over 50% annually in rental program costs by switching to Grippy Floor Mat. 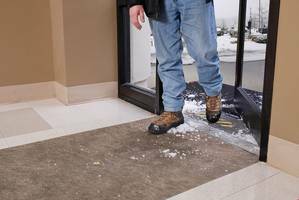 Grippy Floor Mat adheres tightly to nearly all floor surfaces, but peels up easily, making mat relocation or replacement quick and easy. Tough enough for heavy-duty walk-on and wheeled traffic, it won't rip, shred or fray. Grippy Mats are available in rolls of 100' or 50' and can be easily installed to provide continuous coverage on floors with no gaps between mats. For more information, expert advice or to watch PIG® Grippy® Floor Mat in action, please visit grippymat.com or call New Pig at 1-855-GRIPPY1. 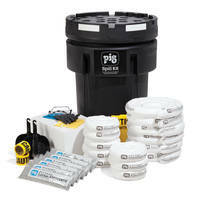 Pig® Grippy® Floor Mat comes with liquid-proof barrier layer. Fuel Station Spill Kit comes with UV resistant container. Sticky Mat keeps feet clean. Flood Light Floor Mat lasts 10-15 years. Boat Mats protect against effects of vibration and shock.